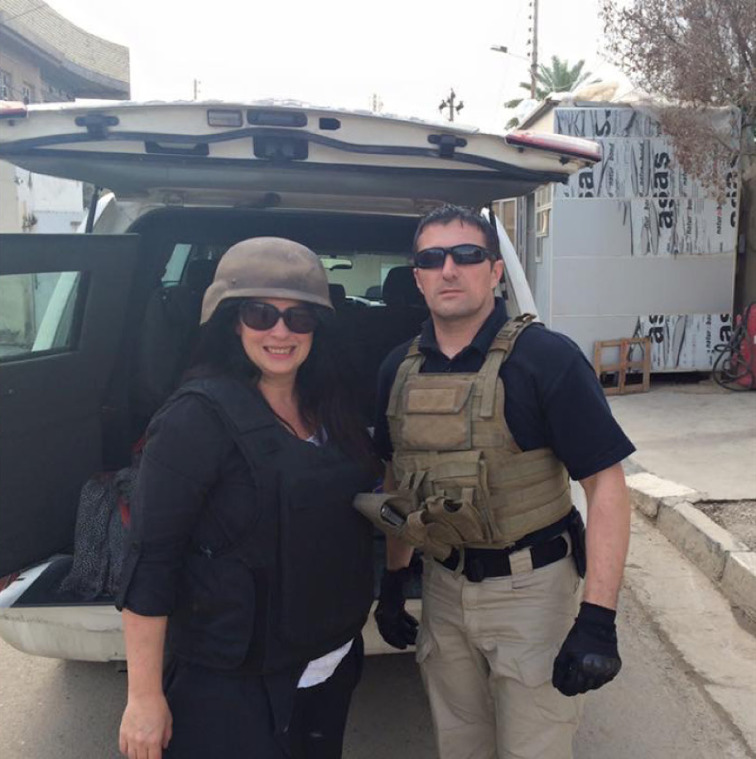 Clad in a flak jacket and flanked by security guards, I recently spent a week in Baghdad -- just 40 miles from ISIS territory -- as part of a branding research project. That's what I do: My U.K.-based Seven Brands specializes in creating, designing, marketing, advertising and managing international brands that appeal to multi-cultural audiences. We help global businesses reach the least accessible audiences in the world -- like the audience in Iraq, where the lesson, it seemed to me, was that, at its best, branding is hope. Why, for example, in a place where the roads are pockmarked from car bombs and the detritus of war litters the streets, would 17-year-old girls be obsessed with Michael Kors handbags? Why do brands matter in a city where practically every resident has a personal story of tragedy? Where a suicide truck bombing in early July killed over 200. This desire to restore normalcy, recover and rebuild is evident in small pockets of affluence across Baghdad. In Iraq's capital, brands like Timberland, Mont Blanc and Ray Ban are starting to appear. Apple’s iPhone 6 was a sell-out when it launched in Iraq at the beginning of last year. Why is this? Aspirational brands represent hope. People associate these world-famous names with the better lives they hope to build. The implication here is that it's up to brands to decide whether they should exploit this hope or seek to live up to it. Opportunities exist where others fear to go. Western brands have struggled for years to resonate with shell-shocked Iraqi consumers in this war-ravaged country. In Iraq, the period of United Nations-imposed sanctions, from 1994 to 2003, prevented most international companies from doing business there. And the security situation since the sanctions were lifted has deterred many from entering the market. So the gap created has been filled, to some degree, by brands from the Muslim world, like Tche, a Jordanian dining chain; Papa Roti, a snack bar from Malaysia; and Saipa, an Iranian car brand that is the preferred vehicle for Iraqi taxis. Places where global brands cannot or will not operate are an opportunity for regional brands. Hopefully, the future will also see the emergence of local Iraqi brands that target their own people and offer a uniquely Iraqi vision of “lifestyle” in post-reconstruction Baghdad. Fakes abound in Baghdad. For example, fast food chains such as Kentucky Fried Chicken and McDonalds, which were originally set up in the Iraqi capital for the U.S. and British military, disappeared when the troops withdrew. But their influence lives on in the numerous rip-offs which have appeared throughout the city. Specifically, there are KFG (Kentucky Family Group), Kentucky Chicken (complete with an image of Colonel Sanders) and MgDonalds outlets everywhere. Young girls carry fake Michael Kors handbags. There is also a large "gray market" for mobile phones that includes fake iPhones, in order to avoid the 18 percent duty that the government puts on telecoms in Iraq. Trademark protection? The traditional methods will not be strong in places like Iraq for some time. Global companies need to decide whether to expose their brands to such a market. Some will chose to go ahead, knowing that the gray market in the long run is creating demand for the real thing. Others may create brands especially for new frontier markets in order to establish themselves without exposing their valuable international brands to an unregulated market. Don’t advertise. Make the world a better place. Visually, Baghdad is chaos. The detritus of destruction is everywhere. Piles of bricks, like anthills, pockmark the pavements. Architectural aesthetics have given way to fortifications, occasional traces of past beauty assaulted by barricades. Everything seems random, jumbled, as if an earthquake had occurred. In the city center, local brands (and some international ones) have plastered billboards above disheveled shops, in a chaotic mosaic that replicates the general landscape of the city. But people don't seem to mind because, right now, the main thing on the minds of most Iraqis is the hope for a peaceful future where they can resurrect their devastated country and their families' future within it. Any marketer who adds another billboard is simply adding to the general noise and chaos. Yet there are small green shoots of recovery. In places like Mansour Mall and Mado café, a visitor sees glimmers of the emergence of a new city, a Baghdad filled with color, lights and sparkle. So, if your brand wants to stand out, don’t put up another billboard. Be a part of the reconstruction story, rebuilding the devastated infrastructure and bringing beauty and order back to people’s lives. How to do that? A brand that put in street lighting (maybe branded with illuminated logos) or built (branded) bus shelters or lifestyle cafes would win hearts much more successfully than a brand that simply advertised. This is a lesson that applies to brands seeking entry in many parts of the world: Don’t put up another billboard. Instead, make the world a better place.